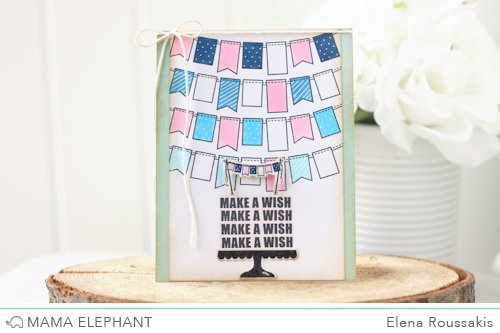 Even though my official guest designing with Avery Elle came to an end last week, I thought I'd create a bonus card on this 5th July Wednesday. I wiped off the ink from the "O" in "oh yes" and replaced it with a balloon. And who better to hold the balloon than the little bunny from Storybook. I filled the space around the bunny with some of the fun stars from the same set. The background was stamped with the longest image from Brushed - I love how whimsical it all looks together. ps, I'm still getting used to my new camera (if you don't follow me on instagram - as mom2sofia, you missed where I gushed about upgrading from my canon T1i to a 6D) so bear with me! In the next month, you'll see a mix of pictures that are shot with both cameras until I can figure this all out. The full-frame of the 6D is throwing me for a loop, but I love it! 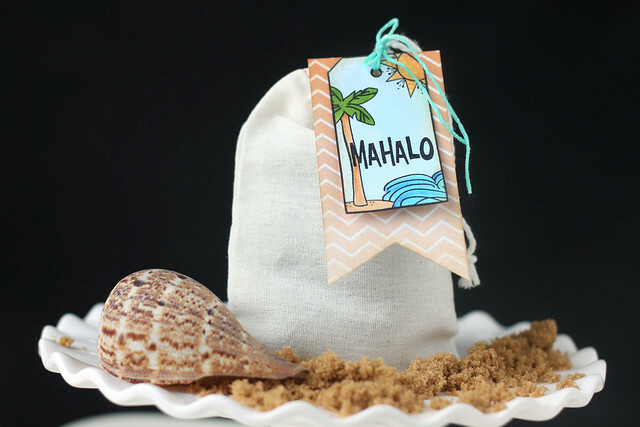 I have a lawn fawn project to share today, inspired by the tags found in *this* pin. and voila! 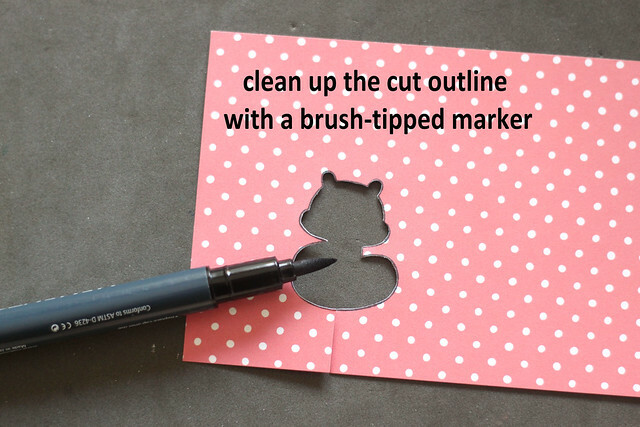 With some careful cutting, and cleaning up the edges with the black marker, it looks seamless! 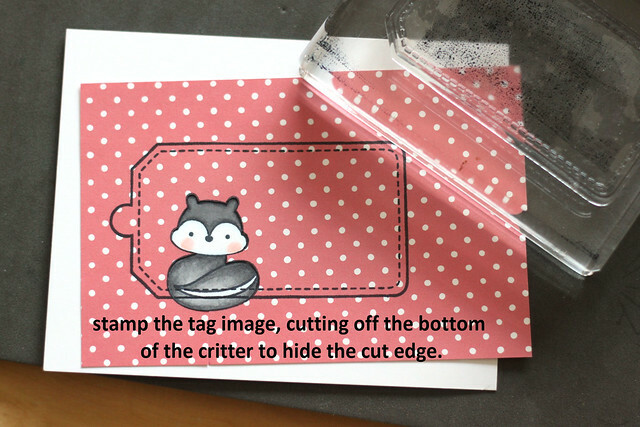 What I also love about this technique is that the backside of the tag is a plain white - just like a print would be. Hi again! 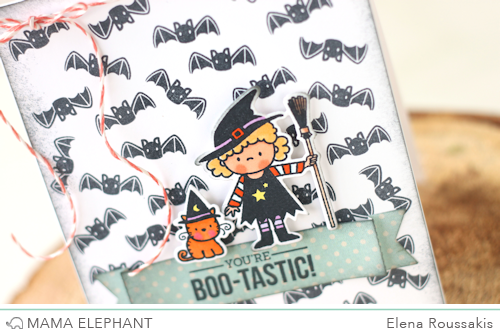 I'm on the Mama Elephant blog today with a Boo-tastic card! 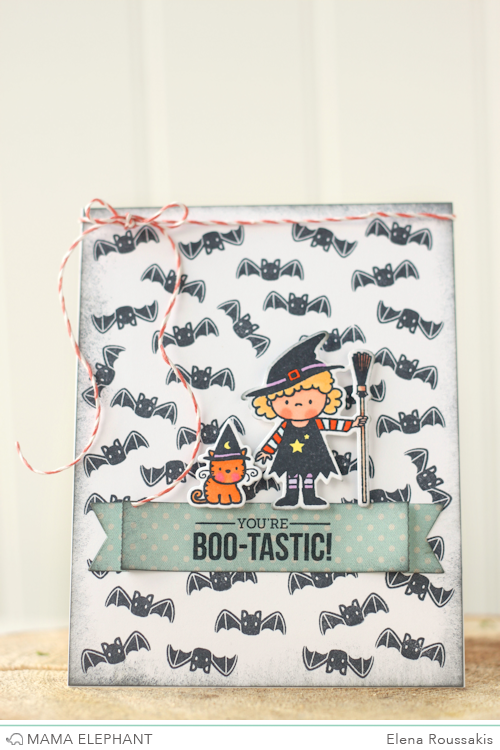 I love the new dies that coordinate with the Bootastic stamp set. I stamped a card-base full of bats, and then used the new dies to make the witch and her witchy-cat stand out. 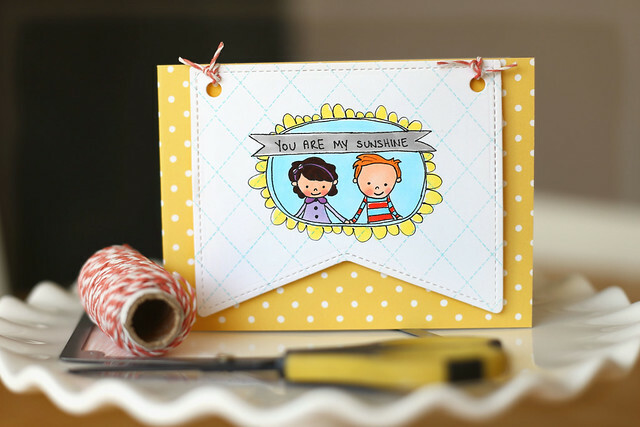 They are both propped up on foam adhesives and grounded by the sentiment banner, and the whole thing is framed by the dark sponging around the card-base. I kept the color palette halloween-traditional with the black and orange, but added some blue and violet to keep things fresh and fun. It's the last day of lawn fawn's fall/winter sneak peek week! I hope you've gotten all revved up for the end-of-august release! 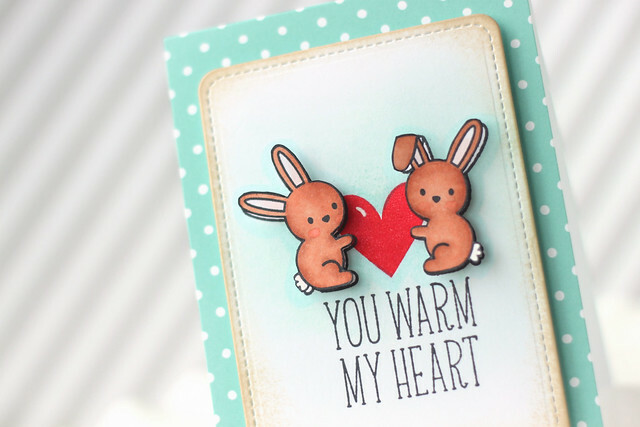 I love the bunnies holding up the huge heart! 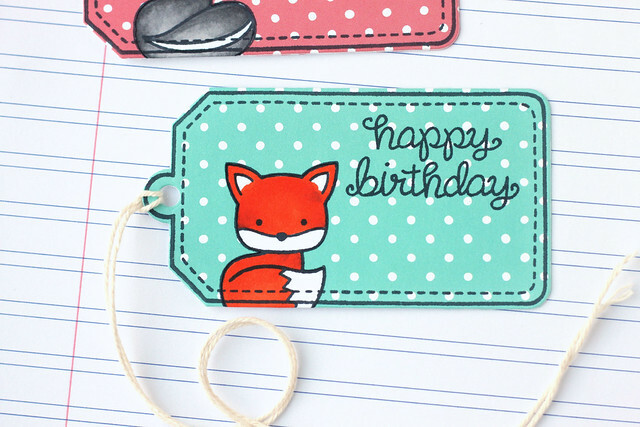 Check out new papers, accesories and inspiration on the lawn fawn blog today. lawn fawn sneak peek week continues! 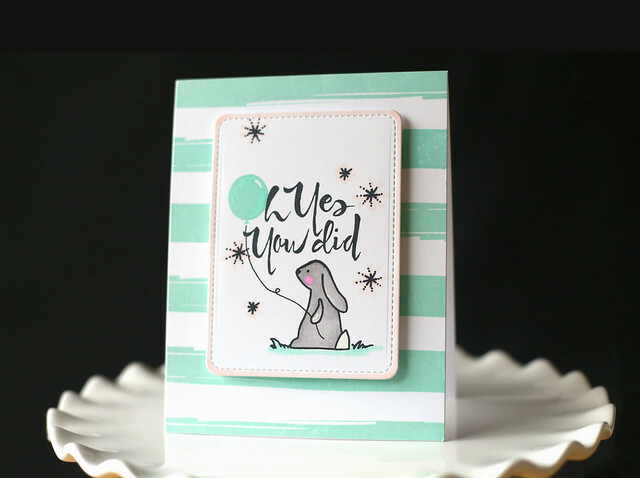 Are you as excited over the new lawn fawn release as I am? I'm still waiting on some sets and dies (it takes forever to cross the border to Canada!) 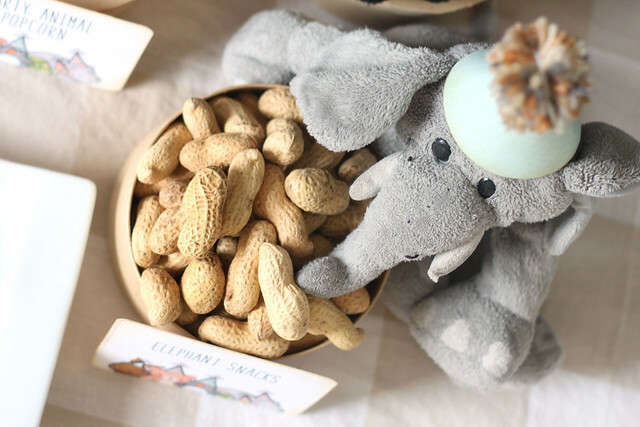 and I'm giddy over every post on the lawn fawn blog this week. hee. I have two cards to show you today, using new sets that will be available for sale at the end of August. 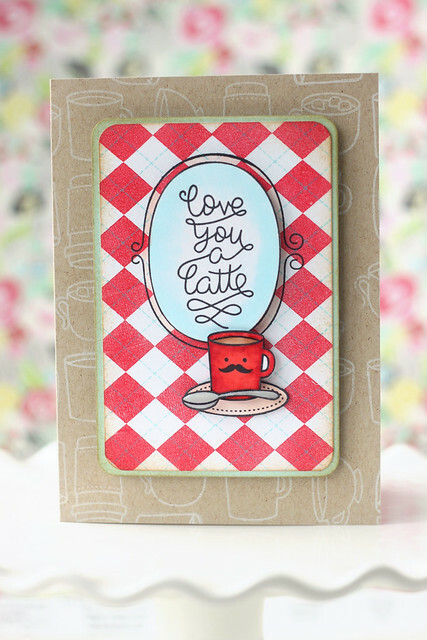 Love You a Latte is the sweetest set! I love the mustache face. I paired the latte images with a cozy argyle background and the frame from Sweater Weather. I stamped the card base full of mug and tea-cup images from the set. My next card brings on Christmas in July. 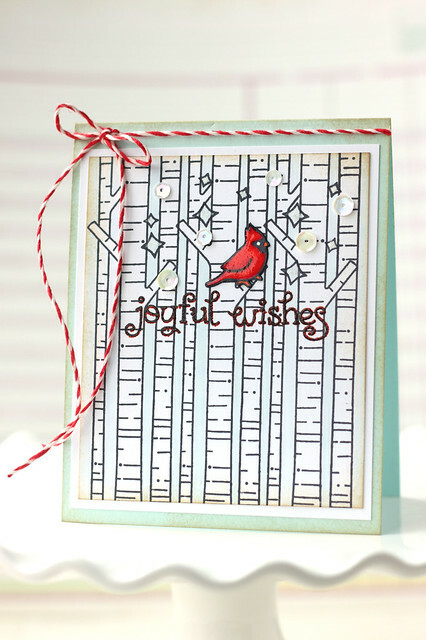 Joy to the Woods is such a fantastic set - I just adore those birch trees! I did a bit of masking to be able to fill the background with the birch trees, and colored the spaces between the trees with a light blue marker. 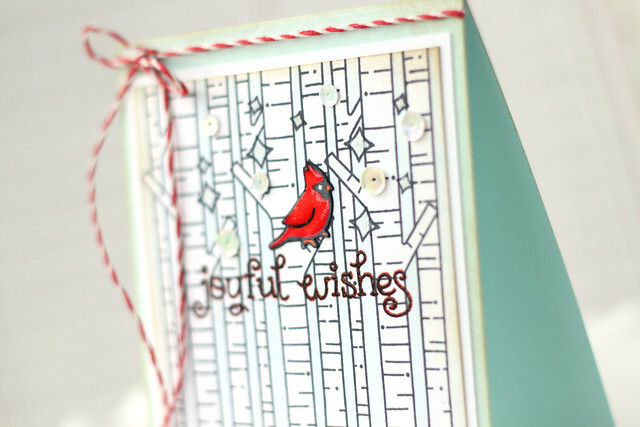 I added a glossy cardinal to one of the branches and double-stamped the sentiment to mimic the cardinal's red and black coloring. I stamped the sentiment first in red ink, and then stamped it again and heat-embossed it with black embossing powder. The red just peeks through. Hi there, and welcome back to another week of guest designing with Avery Elle. Jamie has been an absolute gem to work with, and I thought I'd end off by saying "mahalo." 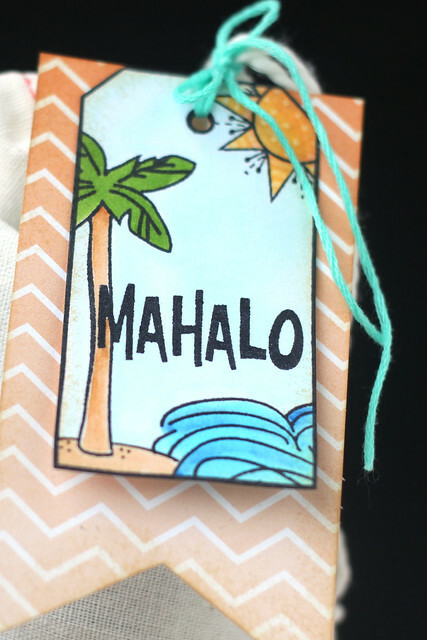 I used images from surf's up, and the tag outline from simply tags: everyday..
Once all of the other elements were stamped and colored, I added a wash of light blue to cover the tag and backed it with a patterned paper banner layer. I liked the cool blue of the tag against the chevron's gradient pinks. I hope you like it! It's been so fun that I may just include a bonus Avery Elle week next Wednesday. sunshine doodles and lawn fawn. 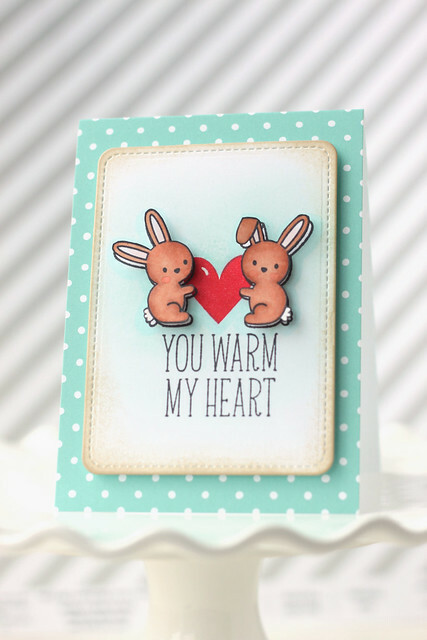 I doodled a little something and paired it with lawn fawn's new argyle background (they previewed it here.) 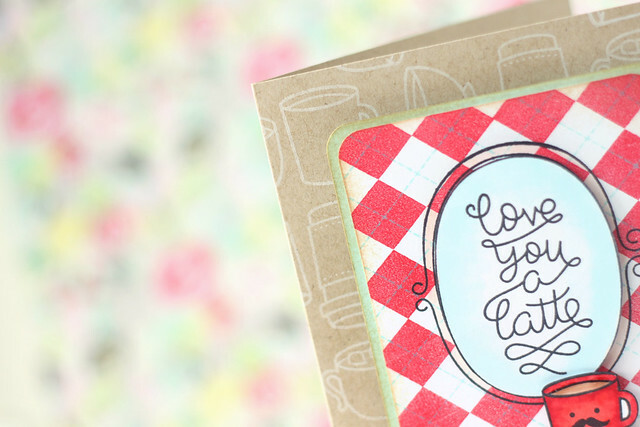 I love how, stamping only the dotted background, it gives a soft and subtle, almost quilted look. I drew my little hand-holding couple in pencil, framed them out, and hand-drew the banner. I went over everything with a copic multiliner pen and then erased my pencil lines to be able to color the images with copic markers. Once I was done, I die-cut my panel with the largest stitched party banner, but customizing it to a smaller size by die-cutting it twice. Are you ready? Oh boy, you're in for a treat. Lawn Fawn is showing you their entire fall/winter release this week, and it is ah-mazing. It will all be available for purchase at the end of August, so get excited, lawn fawn lovers. 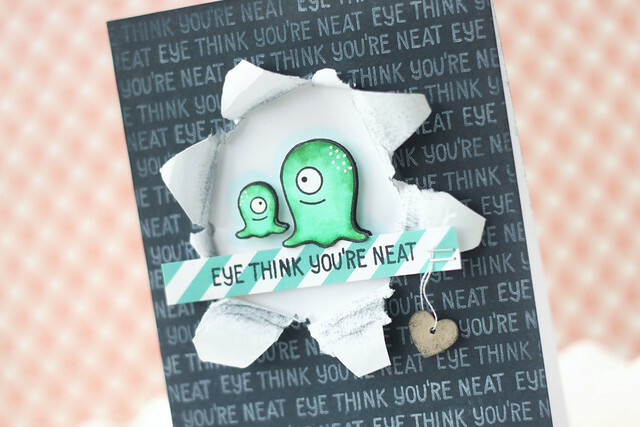 I stamped the adoring monsters (I find it hilarious, the way the eyes are fixed on each other) and fussy cut them out. Just in case the greeting was too hard to read in the background, I stamped it again on a strip of striped paper and attached a tiny, dangling heart from the strip. EYE hope you like it! Check out full set reveals and more design team stuff on the lawn fawn blog today, and all week long. Hey there! 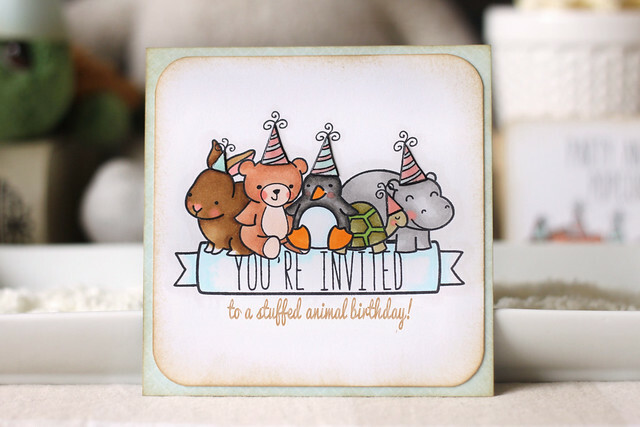 I'm on the Mama Elephant blog today, showing off a birthday card I made with the Soiree stamp set and new coordinating dies. I am supposed to be showing off the dies, but I had too much fun stamping those banners! The stamp set is a new one for me. 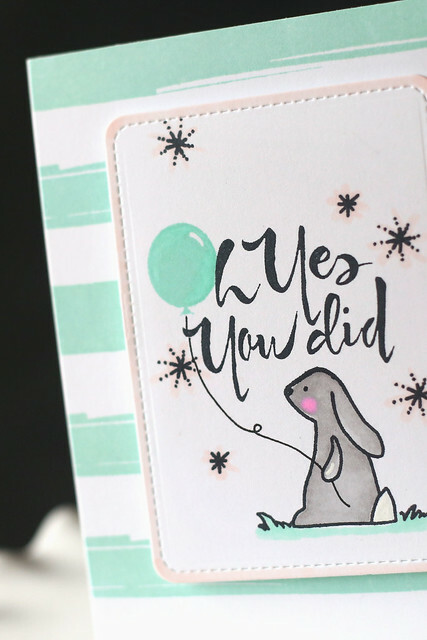 I stamped four rows of the banner image, and colored them in different pink and blue shades, adding little dot and stripe accents with a white gel pen. 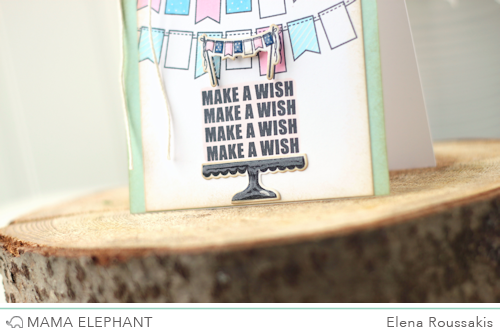 I then stamped "make a wish" repeatedly to look like a cake (!) and die-cut the cake stand and little banner topper. Having the banner topper die-cut saved me from having to mask anything and I love how it looks popped up on foam adhesives. 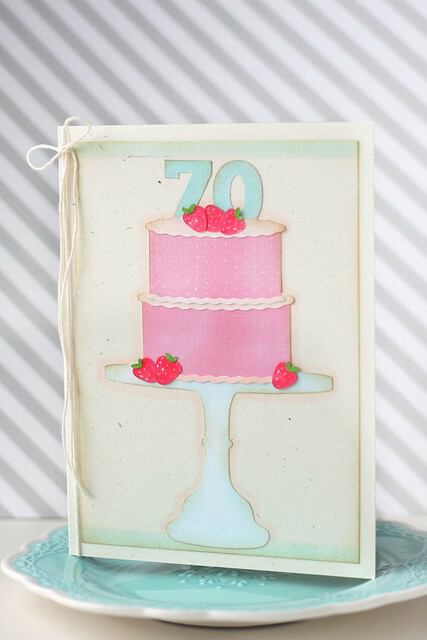 A coat of glossy accents on the topper and the cake stand gives the card a special something extra. 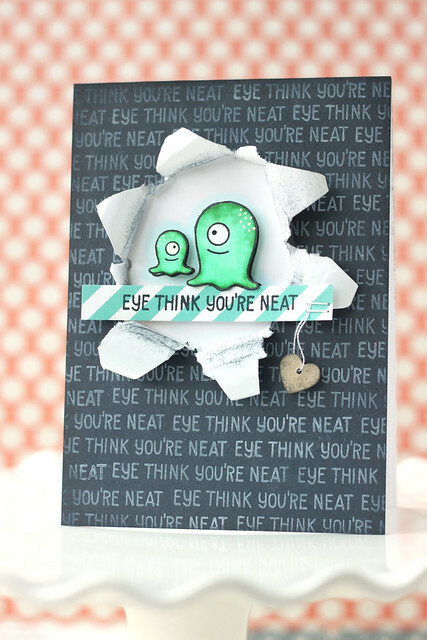 It's another week of Avery Elle guest designing, every Wednesday in July. In case you missed the first few weeks, click and click again! 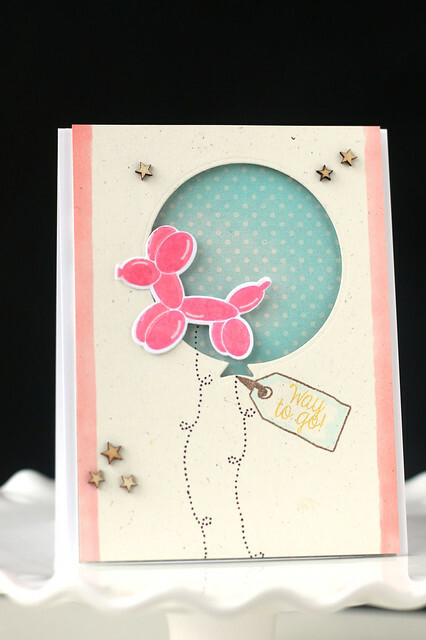 I paired the new balloon dies with the party animal stamp and matching die, and added a tag from thanks a bunch. 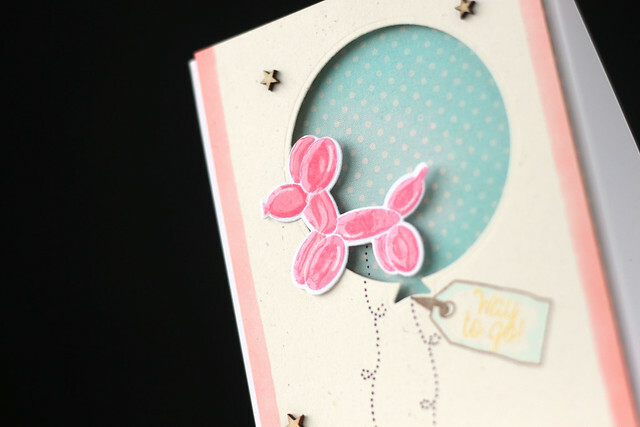 From this angle, you can see the glossy balloon animal in all her glory, and the shading that I added to the patterned paper beneath the large die-cut balloon negative. I hope you like it! I'm having so much fun with Avery Elle this month! Hey there, and happy monday! My mom recently asked me to create a special milestone birthday card for her cousin, and asked me to make it BIG. Like, take a sheet of cardstock and fold it in half big. Enter: the silhouette. 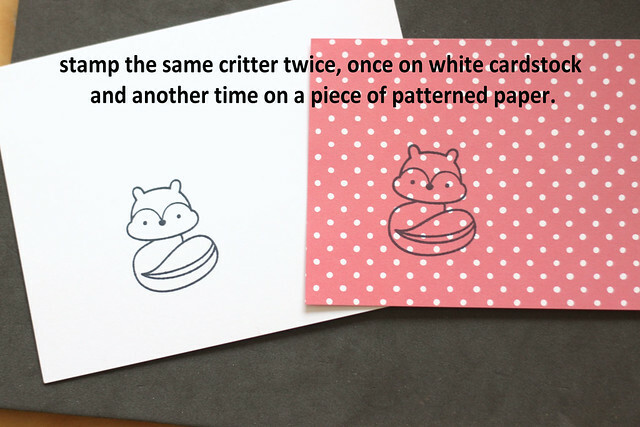 It's my go-to now when people (ok, just my parents) ask me to make bigger cards. I like teeny-tiny cards, they think bigger equals more impressive. ha. I used a silhouette file for a one-layer cake (click!) 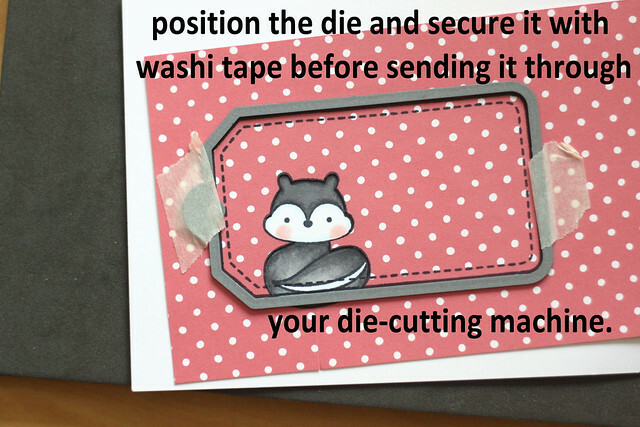 and turned it into 2 layers to better fill the card. Everything was cut out of one sheet of white 12x12 cardstock and then colored with copics. It's a more speedy process, and the result is a softer looking cake. 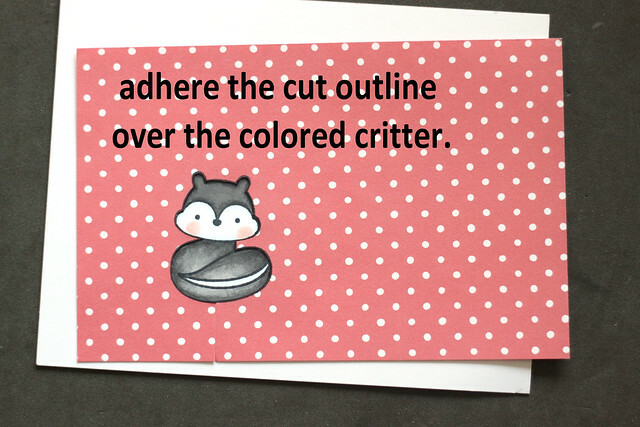 There are color variations that you can't achieve if you cut colored cardstock. I also added a blue stripe to the top and bottom of the focal panel, by way of a copic marker's chisel tip. I like how it frames the cake. 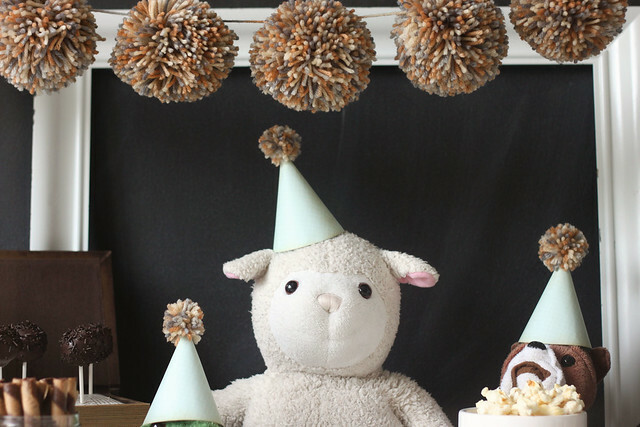 to a stuffed animal birthday party! This set-up makes me giggle. 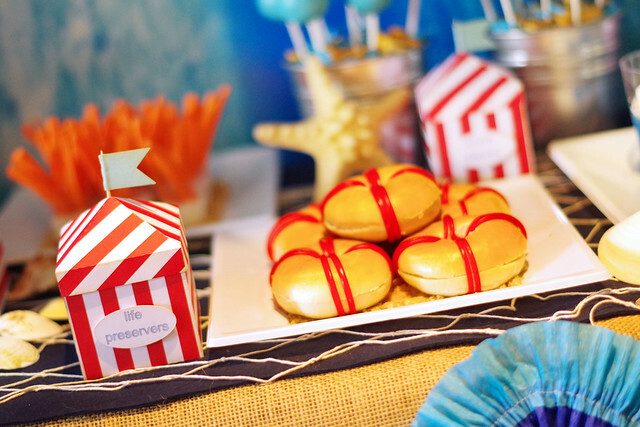 Is there anything sweeter, for a small child's birthday party? 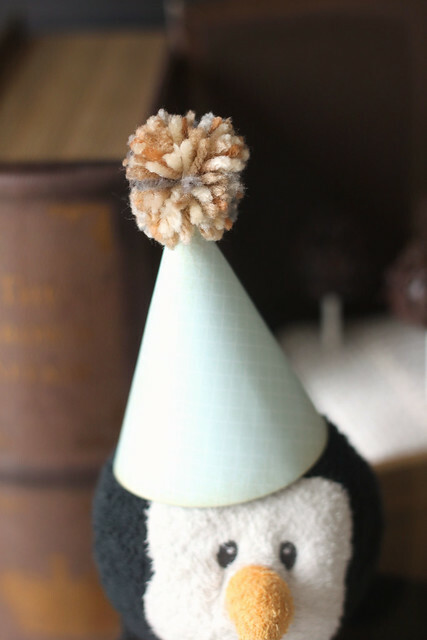 Party hats for everyone! I mean, lookit those eyes. ha. 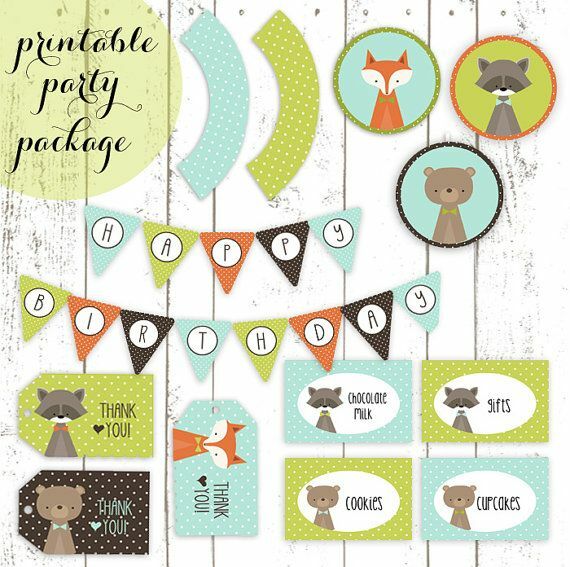 I created this party for lawn fawn, using a mix of their stamps to created a fun scene. I masked the animals to look like they were huddled in together, and gave them party hats, just like their real-life counterparts. 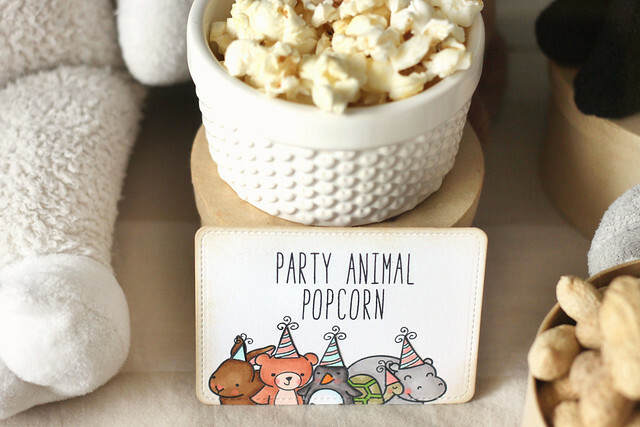 I used my favorite alphabet stamps to create my custom food labels. 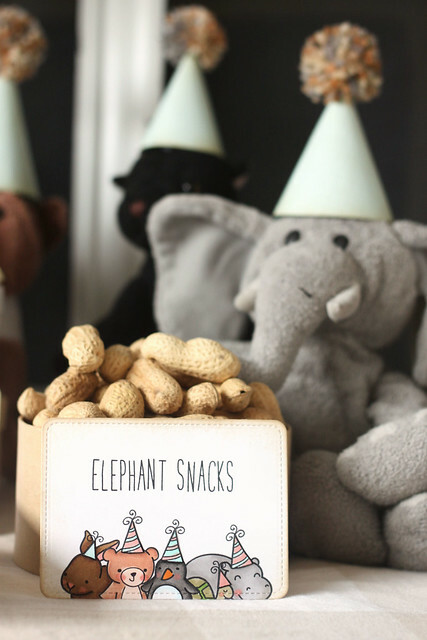 The food is so simple, and there are so many other possibilities when you think of the stuffed animals: monkey munch, penguin pops, kitty cupcakes. I dunno, but they all sound like fun! 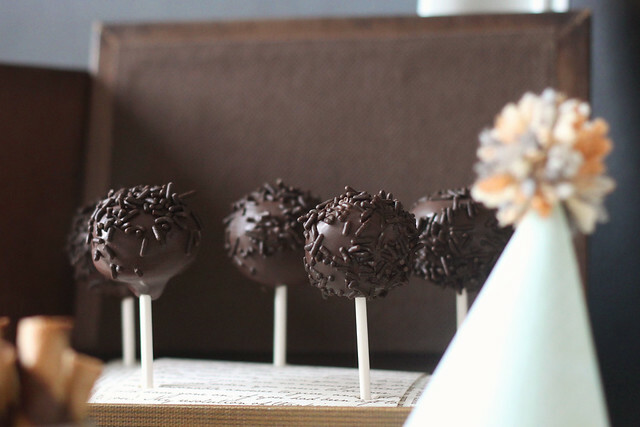 The cake pops look like pom poms, I think, to match the rest of the party. 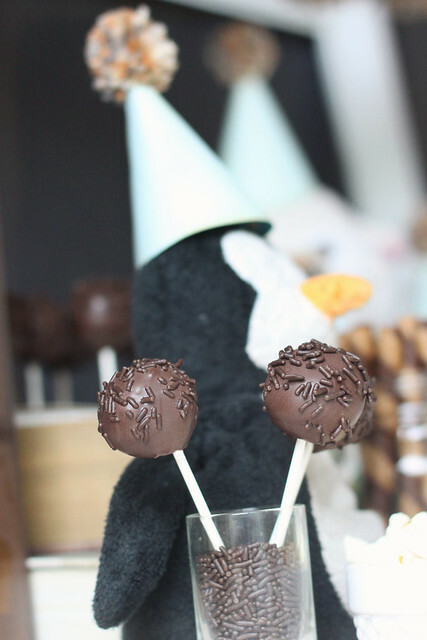 Careful, I think the penguin is sliding a flipper around here... sneaky, sneaky. Kelly asked me how I made the bigger ones when she saw the pictures! 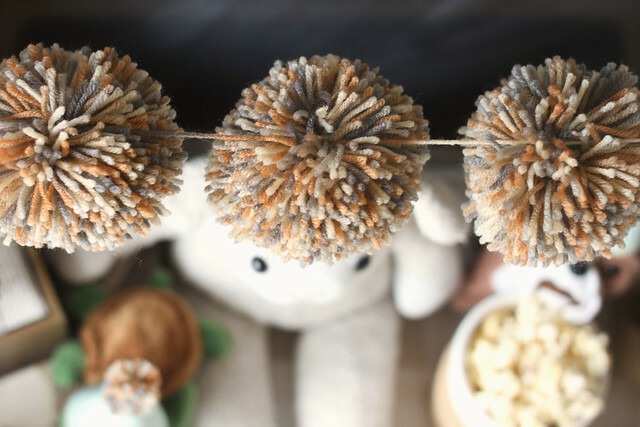 I used *this* pom maker, in case you'd be interested in making some of your own! 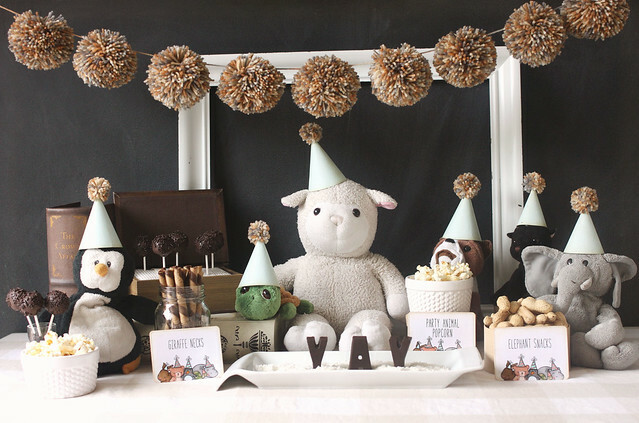 I hope you liked this month's lawn fawn party! 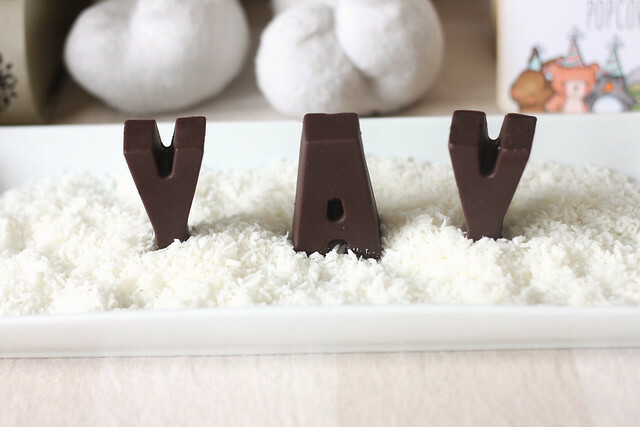 My kids thought it was hilarious, and as always, danced around me waiting for the photos to be done so they could dig in! I'm thrilled to be guesting with Avery Elle all month! 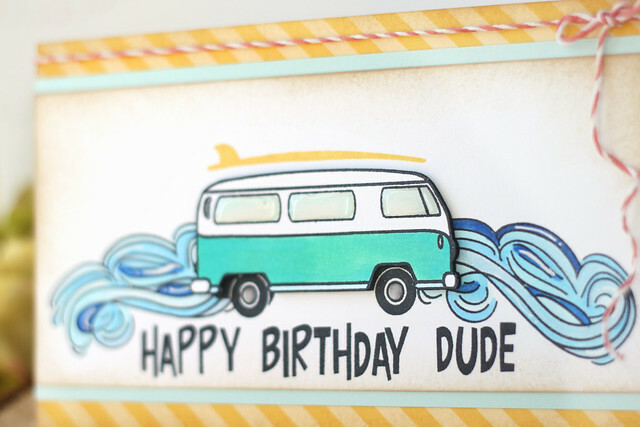 Last week, I blogged Goldie and her balloon birthday, and today I'm showing off a card made with their new surf's up stamp set. You can't get more "summer fun" than this! 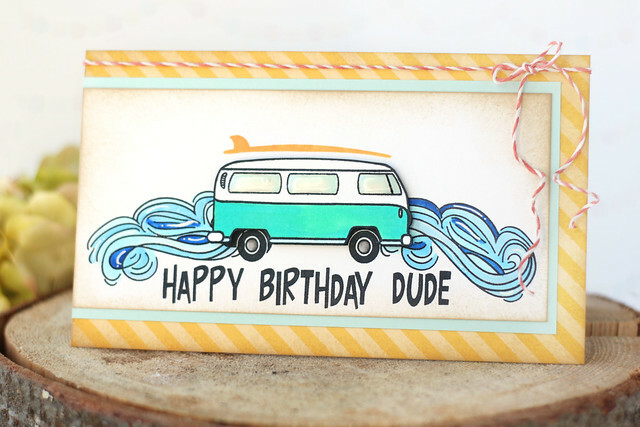 I stamped the wave image on either side of the vw camper, and colored it in different shades of blue. 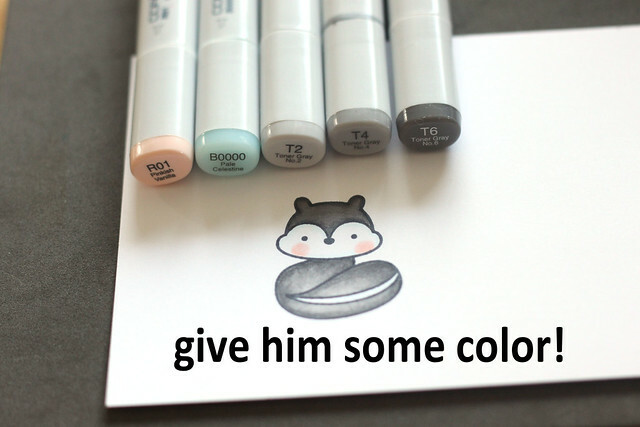 After the coloring, I added some highlights with a white gel pen. I popped up the camper by fussy-cutting it out, everything save the wheels. 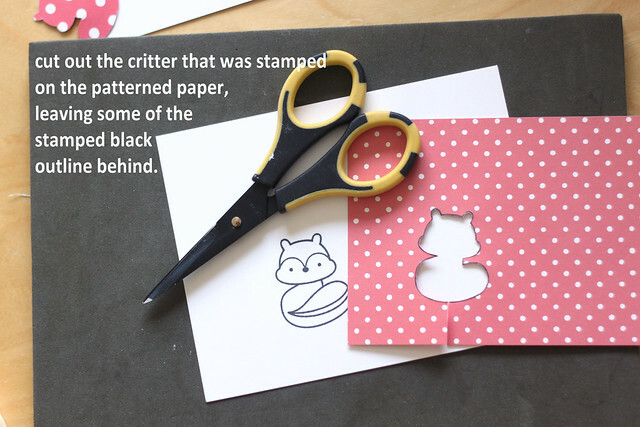 It's so much easier to make a cut look good when there are no curved edges! My favorite part? The glossy camper windows. They look like glass! I added a layer of glossy accents to the windows after everything was colored and adhered and set the entire card aside to dry overnight before handling it again. I hope you like it! 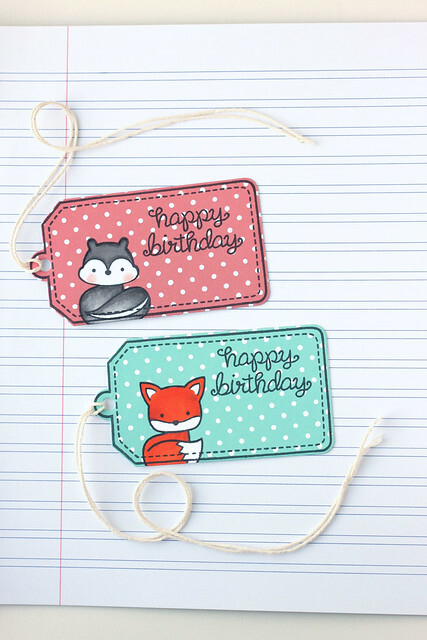 Check out the Avery Elle blog for all kinds of amazing inspiration, and their announcement that they are expanding their line to include patterned paper. How exciting! 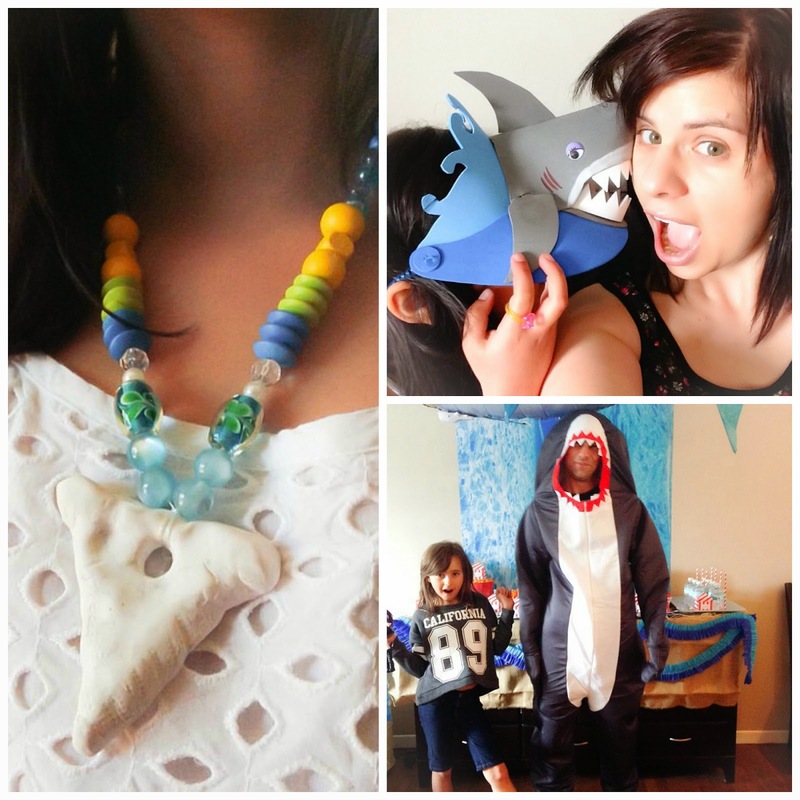 Before Ryan's shark party, (if you missed it, click!) 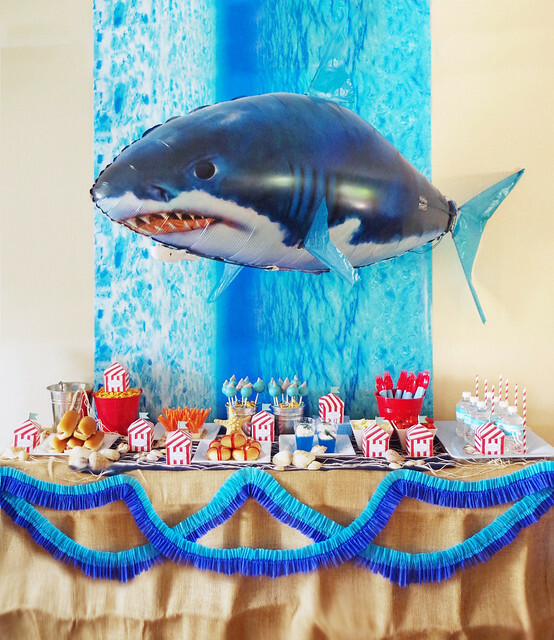 there was Evangelina's Jaws-themed party. I can't claim all of the fun ideas you'll find in this party - Tanya saw *this* party and we adapted what we saw for Eva's spread. 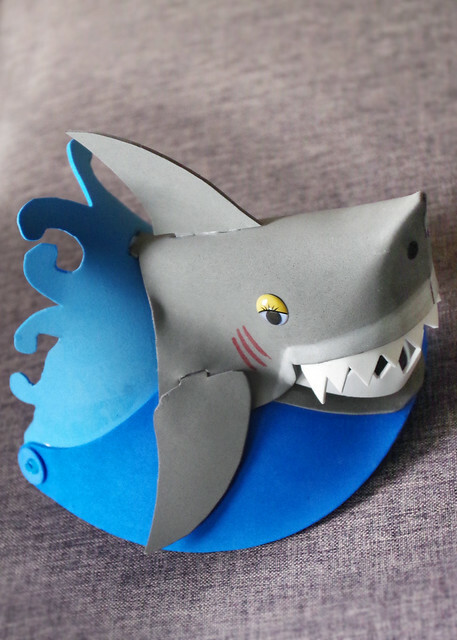 That giant motorized shark was the star of the party, even if it was hard to keep him still enough for a photo. 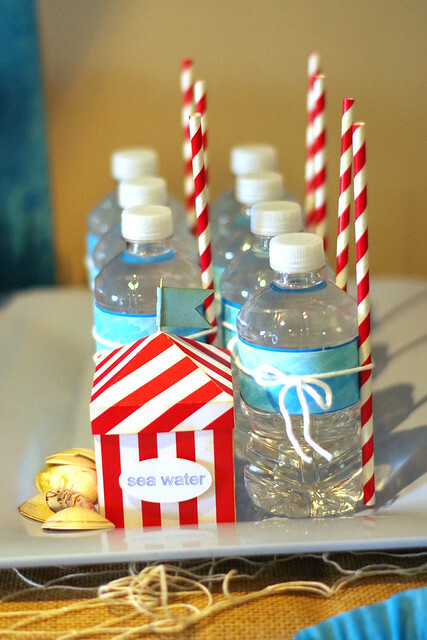 When he wasn't bobbing over the food table, he was swimming across the room, over the girls' delighted heads. The backdrop was a roll of wrapping paper that Tanya found at Michaels, and hung sideways so it didn't look quite as "surf & sky." We still had to endure a few "hey, did you guys hang that sideways?" comments. ha. 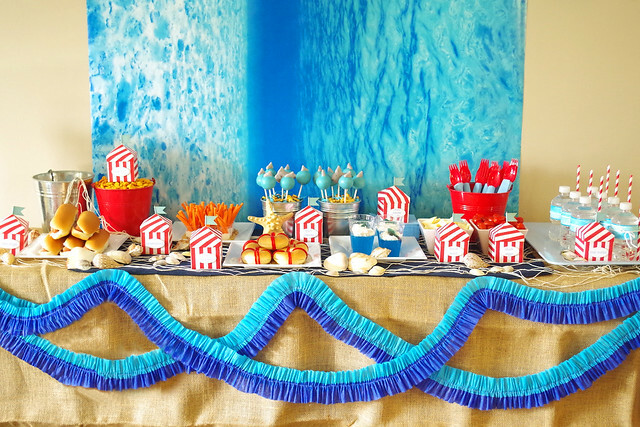 The ruffled banners were modeled after the original Jaws party, and made out of 2 colors of crepe paper. I love the look! The tutorial can be found here. 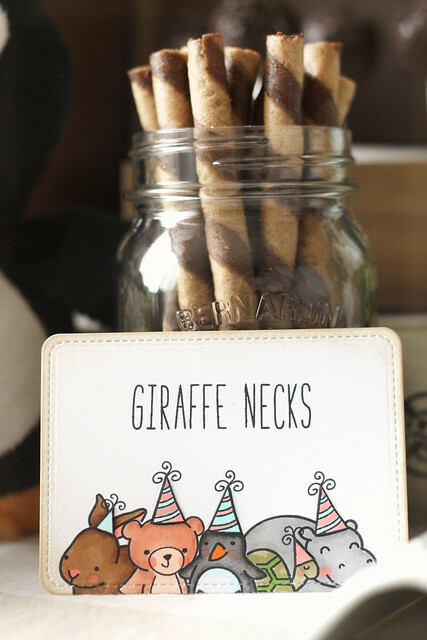 What I love is that I can roll them up and store them for a future party. Which I did. I used them again for Ryan's shark party. 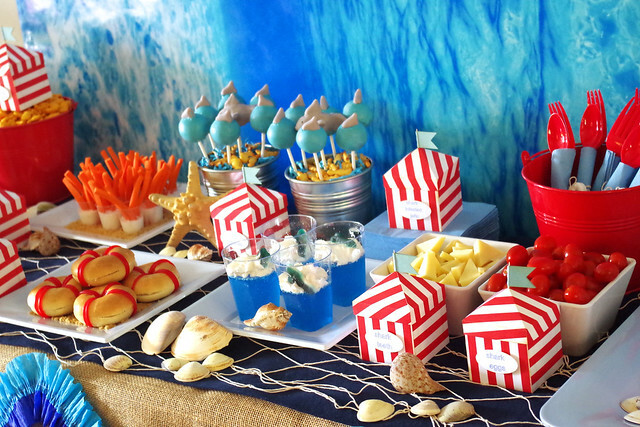 and other fun foods like cheesy triangle "shark teeth," grape tomato "shark eggs," and carrots-in-shot-glass "anemones." 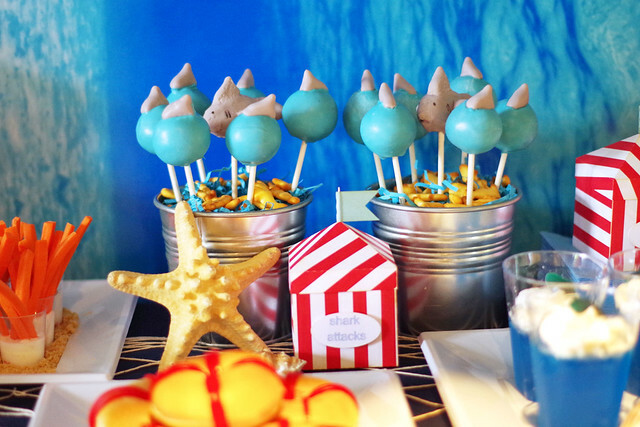 My favorite things were these "shark attack" cake pops. They were adorable! 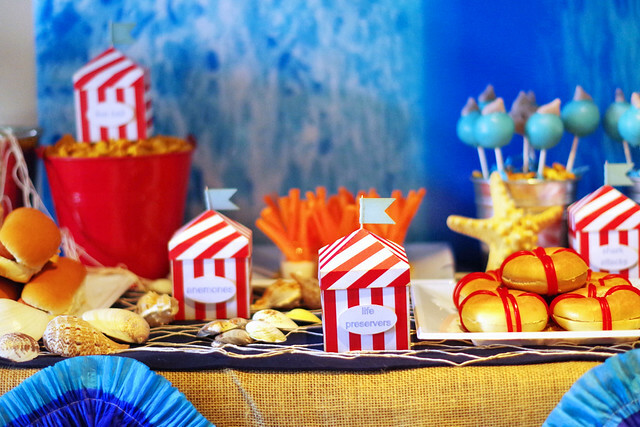 This party was so much fun! Evangelina's dad was a hoot, dressing up in a full-sized shark costume, but he was also amazing with the girls, helping them create their own shark tooth necklaces. Yep, that is one giant shark tooth. And yep, I look nuts. And yep, so does Jason. haha. I hope you enjoyed this look into Eva's Jaws party!